Talk about a triple threat! 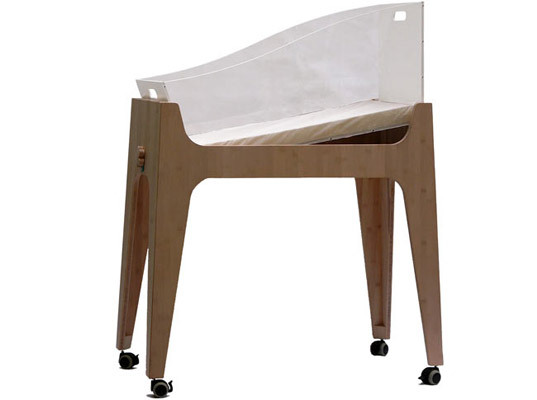 The 1,2,3 Soleil Convertible Baby Bed by Cator & Chouca only looks like a regular crib. With a couple of tweaks here and there, however, you can convert it into a reclining cradle (good for reflux babies) or a toddler desk once your bambino graduates to a big-kid bed. 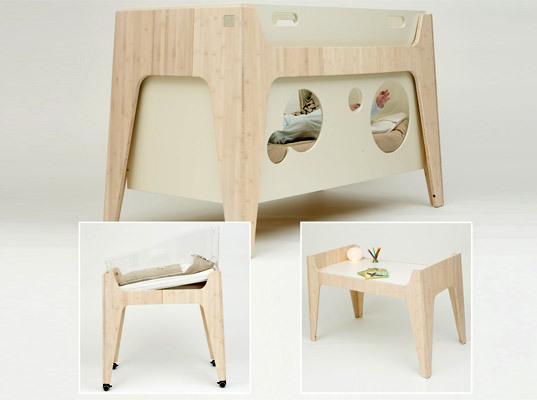 Made in France from bamboo and Plexiglas, the Soleil opts for peekaboo “vision spaces” over the usual crib bars. (The casters come off too, if you prefer the bed to be stationary rather than mobile.) One of the three windows can be unscrewed, so your munchkin and hop in and out of bed by herself when she’s older. But the Soleil also anticipates the day when you no longer require its bedtime services: It comes with a kit that transforms the crib into a junior table.